Hello peeps! This is my entry for The Refashioners 2016 challenge, this year based on making something out of jeans. I had worked with denim just once before, so this is what got me interested in trying to refashion such a classic and ageless garment. I really was curious to see if I could pull off something I could actually love and wear everyday, just like you do with a pair of jeans. Having spent the last few years in Queensland, I own just a couple of jeans and fortunately they all are well fitting, so I reached out for my friends and asked if they had any old dark pairs they wanted to part with. It’s impressive how many clothes we have in our wardrobes that we don’t love or fit any more, such a waste! Anyhow, I got several pairs (eleven to be exact! ), but opted to work with the biggest and more similar in color ones. Keeping in mind I wanted to wear my project this coming winter I went for dark grey jeans. Once I found the jeans, I had to decide what to make. I had already the vague idea of sewing a dress, but what influenced my choice the most was surely the color of the denim. Black and grey jeans scream punk to me – think distressed denim, exposed zippers and all sort of studs – and the Yoyo dress by Papercut seamed perfect for realizing my idea. I wish I took some photos of the making process, but I didn’t, mainly because I was lucky enough to have just the right amount of denim to play with and to make the dress fit into the legs without the need of piecing too many different pieces together. I was really happy to be able to do so, I’m pretty sure I wouldn’t have loved a patchworky-looking garment as much as I love this one. The deconstruction of the jeans was delegated to my sweet mum, who loves crafting as much as I do, and I was extremely glad she helped me as I really hate unpicking. To avoid funny color changes in the dress, I decided to cut the bodice out of one pair and the skirt from the other one and the only alteration I had to make in order to fit the pattern pieces into the legs of the jeans was to add a center seam along the back bodice and skirt. Before cutting into such a treasure of material, I made a toile for the bodice (I already knew which size and which alterations to make to the skirt as I’ve already made it once before), and lucky I did it. I traced an S for the bust, and in between S and XS for the waist and had to alter the pattern a bit – I moved the bust darts down by 1″ and shortened the waist darts by roughly the same amount, lengthened the bodice by 5/8″, increased the side seams by 1/4″ and did a 1/2″ round back adjustment. The fit around the back and shoulder area is now nice, but getting smooth darts on heavy denim fabric was quite difficult and there are some wrinkles on the front bodice Im not very happy with. That said, I’m satisfied with the general fit of the dress and I can’t wait to wear it layered with warm turtlenecks and tights – that’s why it has a relaxed fit. 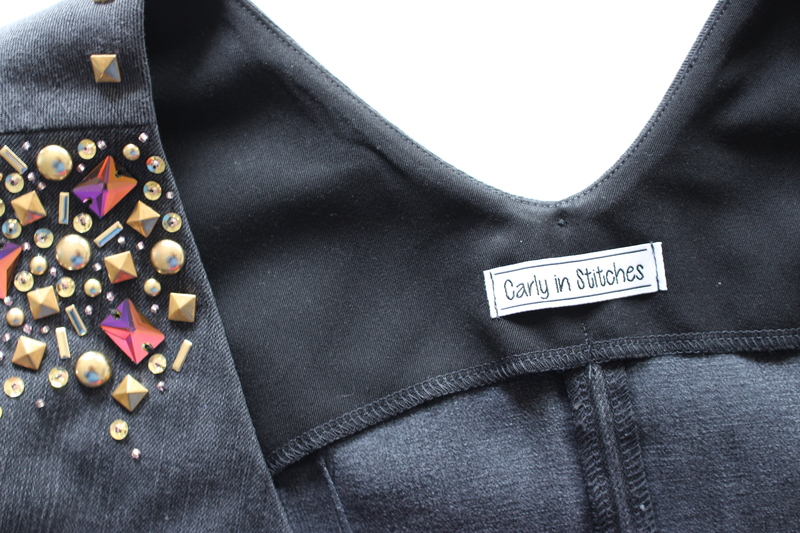 The dress went together quickly, but before attaching the facings and finishing it I had to stitch in all the studs, Swarovski crystals, pailettes and beads I got to embellish the shoulders area. Iron settle the round studs, hand piece the square ones and hand stitch all the other little pieces was a slow task, but I really enjoyed it. Thinking of it, I really loved the whole slow making process of this dress – from waiting for my friends to deliver me the jeans to unstitching the pair I chose, from trying different pattern cutting options to re-sewing together the pieces and slowly decorate them, everything done taking my time and enjoying seeing this dress coming alive little by little. I had another pair of unloved black jeans, but they were too small for cutting the facings out of the them, so I used some heavy black cotton drill instead. I’m pleased I did so because I had way less bulk to deal with in certain areas, above all at the underarms and along the zipper. I’m very happy with this Yoyo dress details – I like how the old worn leg seams are still there, along the sides and center back, a reminiscence of what this dress used to be, and I hope to get many wears out of it. 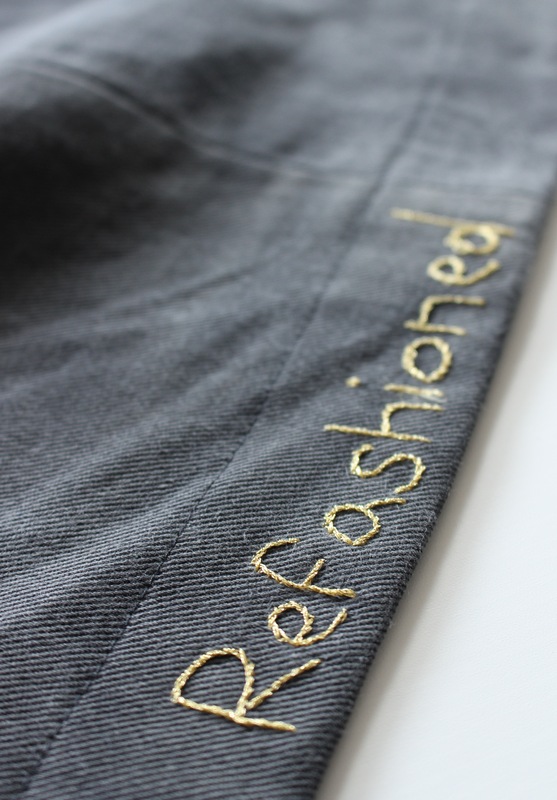 It was definitely a labor of love, but the process of refashioning an old unloved garment really got me inspired and I’m already planning more ways to reimagine jeans. 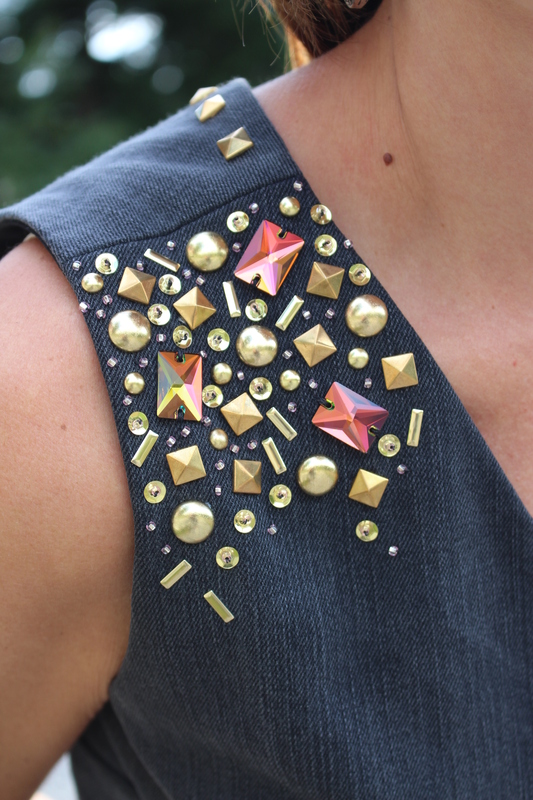 I’m sure my current job – I’m a “serial sewer” – played a big role in deciding to take part to the Refashioners challenge, and while I’m proud of being able to sew quickly and precisely for the garment industry, I enjoy much more creating unique and one of a kind pieces like this one. Thank you Portia for hosting such an amazing challenge! Thank you!! I’m a bit obsessed writhe broilers lately, so I had to add it to this dress somehow! Thanks! The Yoyo is an awesome pattern, got lots of wear out of the skirts and I hope to do the same with this one! I agree! I made one this year in wax fabric and I love it! Even if the fit is not as perfect as yours! I will certainly have another try! This is amazing one of my favorites !!! I love love love this dress on you!! Seriously rock and roll.